Good morning and Happy Monday! Today I am excited to be a part of an exciting and amazing giveaway; I mean who doesn’t love a good giveaway? Below you can enter to win some amazing prizes and discover some new blogs to follow. Sounds like a win, win right? That’s right, folks. It’s a gift card extravaganza! The fabulous ladies who bring you the blogs listed below and I have come together to bring you the chance to win four fantastic gift cards (that’s right, winner takes all!) What would you do with $200 to Amazon.com? Or how about $100 to Target? Need a coffee fix? (and we all need one of those on Monday morning.) We’ve got you covered with a $50 Starbucks card. And breakfast, lunch and/or dinner is covered too! 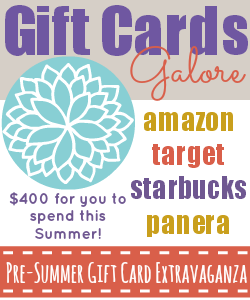 With all of the fantastic choices at Panera Bread and your $50 Panera Bread gift card, you won’t starve! Please note, if you live outside of the US and are selected as the winner, you will be given a $400 gift card to Amazon.com. Please see terms and conditions in the rafflecopter. Thank these wonderful ladies and then enter to win this FANTASTIC prize pack! This giveaway runs from 8am EST, Monday, May 6th and ends on Sunday, May 19th at 11:59pm EST. A winner will be announced on Monday, May 20th. Enjoy and good luck! Gift Cards Galore – WINNER!